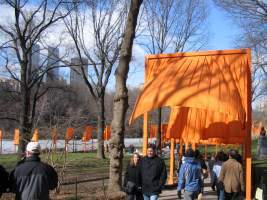 By a strange twist of fate, I was in New York City over this past weekend, so I was able to experience The Gates firsthand, on its first day, no less. The idea of doing something like this is very cool, and getting it done is even cooler. Any engineer would recognize this as a great hack. The park had a definite party atmosphere Saturday morning. 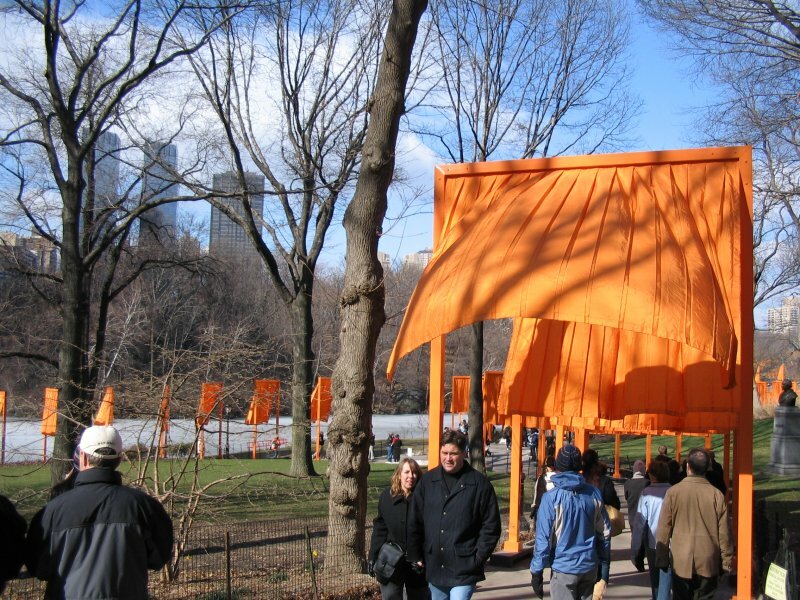 Christo has said that he wants The Gates to reintroduce New Yorkers to their park. While this is a bit condescending coming from a non-native, he seems to be acheiving his goal, which is a good one. It has created a huge discussion about the nature of art, especially public art, and that’s good. Suddenly everyone is focused on something besides politics, war, and reality TV. The color is wrong. The descriptions all use the word “saffron”, but let’s face it: they’re orange. And not just any orange, but exactly the same orange as anything to do with road construction. It just isn’t that unusual to see that color in New York City. (After leaving the park, I saw the back of a temporary traffic diversion sign that was nearly identical in color, shape, and size to one of the Gates.) Subliminally, I felt like I was in some kind of danger walking around all that orange. I know that Blue and orange are complementary colors, but maybe a different color would have been better. How about pink again? The scope of the project is bipolar: on the one hand, each gate is quite modest, and is experienced quite intimately. But I think the interesting part of the project is the huge scope, as all the reviews mention (“7500 gates throughout the park”). It’s very difficult to get a vantage point from which to appreciate the full scope. Overall, I give it a thumbs-up. Oh yeah, we also saw Julian Sands in the park. Your good/bad points make it sound like, for you, a work of art has to involve you personally, so you feel like you are a part of the work, and can relate to the concept. Many will agree with you on this. However, many others (especially those of us who got art degrees and had years of discussing these points) would argue that any art that makes you think and react is a success. Your bad points might actually be exactly what the artist wanted to convey. He may have wanted to give you that subliminal feeling of danger. And the dichotomy of scope is absolutely a valid artistic point. Frankly, this work is much better than many of his previous works because it can provoke such a great variety of reactions and thoughts. One of the beautiful things about art is when you get a variety of reactions. Many times, the message of the work is something that the creator never even thought about. That is what makes this kind of installation so interesting. Hi Ned, I was there on Sunday too! Would have been fun to meet up (third gate on the left after the hot dog stand?). I really loved this project! Initially I was skeptical but once I started walking around the whole festival atmosphere really drew me in. What was most thrilling to me was how it affected the Gate walkers. Everyone was smiling, happy, excited and friendly. I have never experienced Central Park quite like this before!